The list of invoice finance companies in the UK has grown in recent years with the addition of products such as asset based lending (ABL), selective invoice discounting, spot factoring and the emergence of online receivables finance auction sites, and peer-to-peer lending. This has increased the choice for our clients, which is great news. However, the increased choice has also created more difficulty choosing a provider, because of the large number of choices. Fortunately, we have undertaken extensive research in order to understand which providers offer the best rates and the best service levels. 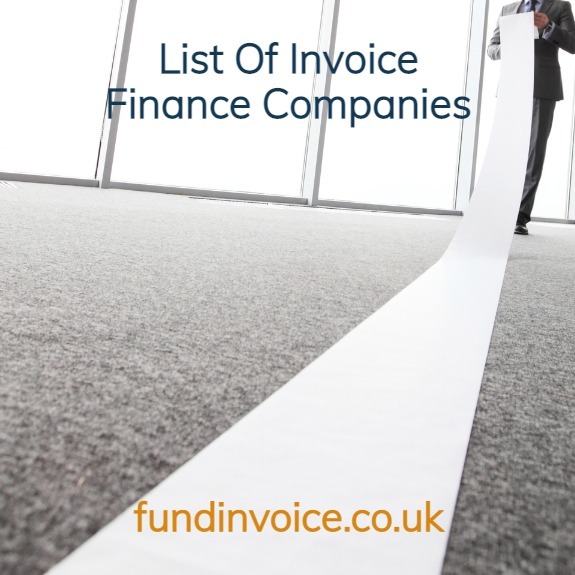 Below is a list of the UK's invoice finance companies. If you were looking for a list of factoring companies or a list of invoice discounting companies we can identify those for you, from the full list below. The list of invoice finance companies (and list of factors) below demonstrates the large number of choices available to client, but you may want help to narrow the choice. FundInvoice LLP are the UK's 1st research led independent, invoice finance advice and search service for invoice finance, factoring & invoice discounting that have access to the UK market. Our invoice finance experts have extensive experience of the market and they will be able to put you in touch with the invoice finance companies that are most suitable for your business based on exactly what you are looking for. We offer an independent quotation search for invoice finance quotations and you will have no obligation to proceed. Please note that the presence of a business on our list below, does not constitute any endorsement by FundInvoice LLP. Sancus Finance Ltd (formerly known as Platform Black - due to shut down). Scottish Pacific Business Finance (due to exit the UK market). We have evolved our list over the last decade and a half, however we are contacted by approximately one new provider every other week at present. Therefore, there may be additional providers that you think we should add. If you have any other providers that you think should be added to the list please contact FundInvoice, we are always happy to add to our list of factoring companies.